Could These Twin Glassy Towers Be Coming to the Greenpoint Waterfront? Momentum is building along the Williamsburg-Greenpoint waterfront. Since the Bloomberg administration’s sweeping 2003 rezoning of the two-mile stretch of East River shoreline, nearly every buildable river-facing plot has been accounted for by developers. More than a dozen master plans are in the works, dominated by residential uses that scale upward to 50 stories and 600-foot heights. One remaining mystery lot is a block-long parcel in Greenpoint currently holding a two-story warehouse at 161-167 West Street (aka 53 Huron Street). 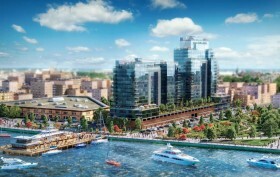 The 65,000-square-foot site lies near the India Street ferry stop and is sandwiched between three development sites: Park Tower Group’s ten-tower Greenpoint Landing master plan and Mack Real Estate Group/Palin Enterprises’ 10 Huron Street (155 West Street), and The Gibraltar at 160 West Street.